‘Walking Dead’ Casts Its Zombie Killing Ninja, ‘Michonne’!!! One of my favorite characters from the ‘Walking Dead’ books is that of Michonne. Michonne is a female zombie killer to put it lightly. She wields a kitana blade and is extremely deadly. She is a complete badass. Well now AMC has cast its Michonne, and it is none other than Danai Gurira. You might have seen her in HBO’s ‘Treme’. In the season finale of Season 2 of ‘Walking Dead’, guess who shows up for a split second? You guessed right. It’s Michonne. This news comes a month after casting David Morriessey as the evil Governor for the series. The cameo of Michonne in the season finale of season 2 ‘Walking Dead’ has Andrea running for her life in the woods trying to catch up to the others when she is out of ammo and a zombie is on top of her, someone slices the zombie’s head off just in time. 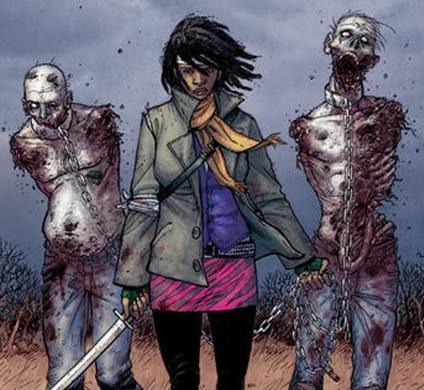 We see a hooded Michonne wielding her sword with two zombies chained to her following her. If you remember from the books, Michonne shows up like this. These two zombies are her boyfriend and his friend. She keeps safe from them, for she has sliced off their arms and lower jaw. Michonne’s first appearance is in issue #19 of the comics and quickly becomes an integral part of the group. She has survived all the way through the books currently, which they are on issue #94. Get A Sneak Peek At Michonne Slicing Up Some Zombies in the Upcoming Season of ‘Walking Dead’!!! ‘Walking Dead’ Has Cast Its ‘Governor’!!! This entry was posted on Sunday, March 18th, 2012 at 10:03 pm	and is filed under News, Television. You can follow any responses to this entry through the RSS 2.0 feed. You can skip to the end and leave a response. Pinging is currently not allowed. « NBC Gives ‘Grimm’ a Second Season!! !